10/5/2016Share this story on Facebook! Each fall, the School of Business hosts the Business Idea Competition, which is open to students from all majors. Participating teams have four minutes to present their ideas to a panel of judges and four minutes to answer questions from panelists. A total of $7,500 in prize money is awarded to 12 teams. The Business Plan Competition takes place each spring. Six businesses give a 10-minute presentation about their company, followed by five minutes of Q&A from a panel of experienced judges. The first place team is awarded $20,000, the second place team takes home $10,000, and the third place team receives $5,000. A revving chain saw, terrified screams, and frantic breathing all sound out within the first 10 seconds of the video. Suddenly a voice growls, “Everyone is going to die tonight,” as a man wearing a bunny mask and holding a chain saw appears on the screen. Last fall, a scaled down version of Fear Walk, called The Haunt, debuted in the IC Natural Lands during Halloween weekend. When Minard approached Davis about turning the idea into a startup business, Davis was hesitant at first and did some research before deciding to go with the idea. 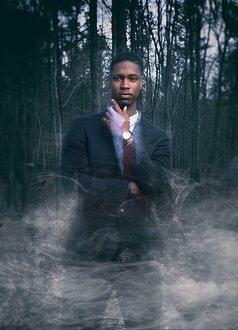 He presented the idea for Fear Walk at the Ithaca College Business Idea Competition in November 2014 and came in second, winning $750 to help get the enterprise off the ground. The two friends finalized their business plan and entered the Ithaca College Business Plan Competition in April 2015, where they won third place and took home a $5,000 prize. “All within five months we had legitimized ourselves as a company, and we were ready to start producing and providing this experience,” Davis said. To keep the environment as student-run as possible, Davis worked with The Studio, an on-campus student organization that works with other organizations to promote events. “I wanted to do business, and I feel like there are a lot of other students in other majors who want to do what they’re learning about,” Davis said. “They don’t just want to learn through the scope of a textbook or an online interactive system. So we reached out to The Studio and IC After Dark.” Both of these student organizations give their members hands-on learning opportunities. Freshman Sarah Cummings was head of campus outreach for The Studio, which meant she was in charge of tabling for events, advertising, and generally making the community aware of things happening on campus. Davis said Fear Walk faced challenges and hardships from day one. On their first day of selling tickets, Davis said no one even stopped by their table, which made the team rethink their marketing approach. Another hurdle was not coming in first in IC’s business competitions, but that was also a valuable learning experience. Last summer, Fear Walk entered into an agreement with 13 Floors, a massive haunted house company based in Denver, Colorado. This agreement will enable Fear Walk to enhance its production and scare tactics, and improve its marketing and experience-making capabilities. There is another experience planned for this October at IC as well as expanding to other college campuses like Cornell University and Colorado State University, where Minard is a student. Davis said he also wants to make the experience larger, with more actors and more space. “I think we’ve got a lot to work on, but we’re definitely looking to impress,” he said.